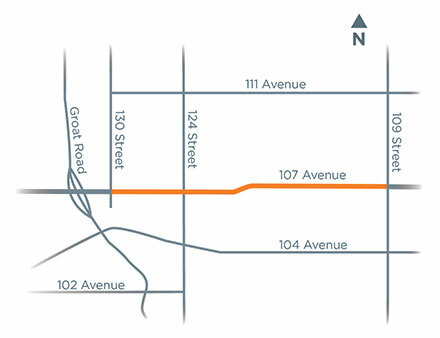 107 Avenue from 109 Street to 130 Street is a narrow 4-lane arterial road, a 24-hour truck route and a significant transit corridor. It runs through a busy commercial district and is adjacent to high density residential communities. The 109 Street to 130 Street section of 107 Avenue is on hold pending further analysis and evaluation of on-street parking issues along the corridor and in surrounding neighbourhoods. To date, no funding has been made available for the upgrades to 107 Avenue, so there is no timeline for construction.